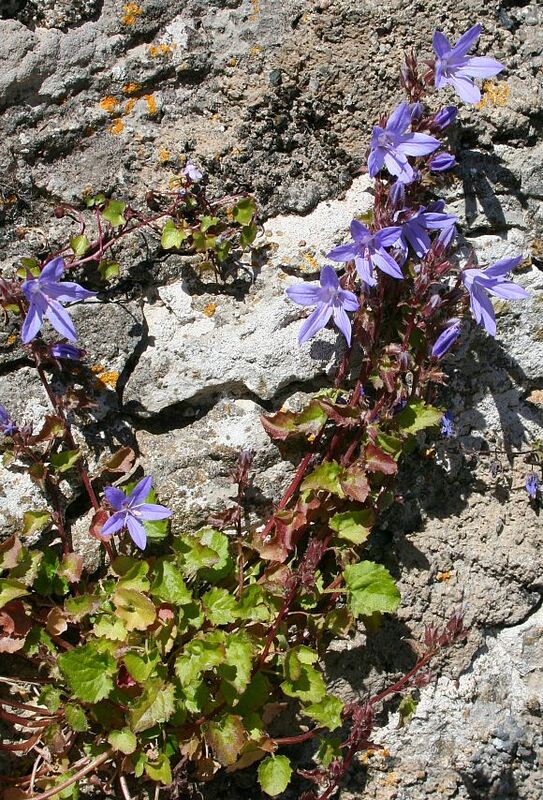 Grows on walls and rocky banks; here flowing over a wall and down the other side. 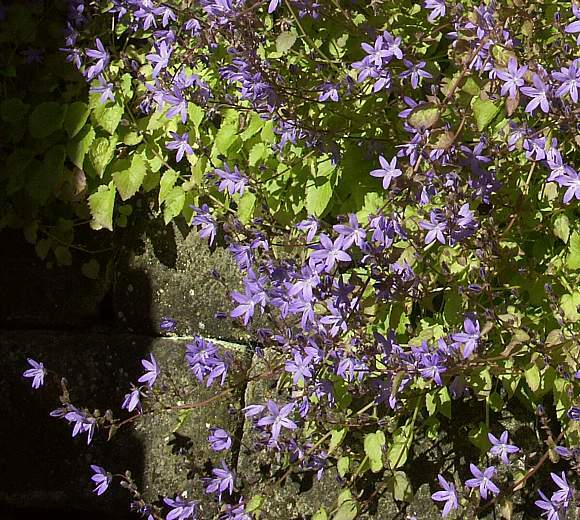 Flowers are a slatey-blue, and more on the mauvish-side of azure (much paler than the violet-blue of the similar Adria Bellflower). 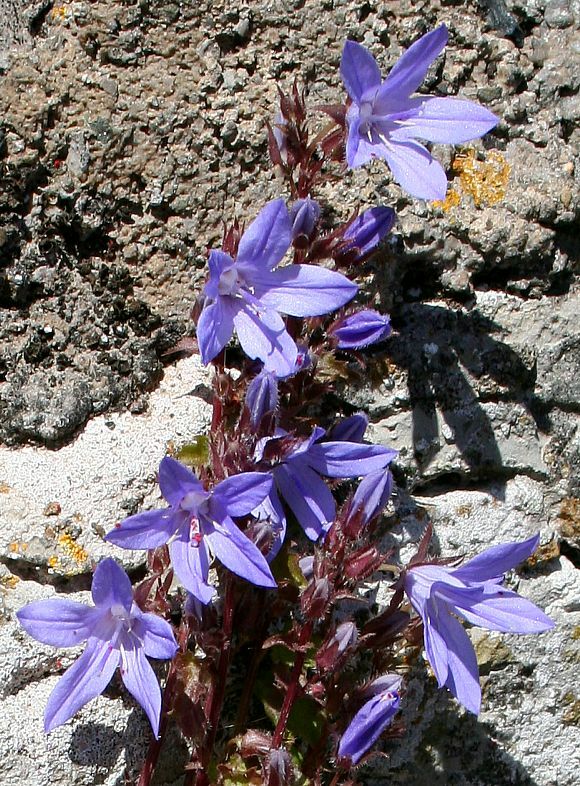 The stems are between 30 and 50cm long as they are for Adria Bellflower too. 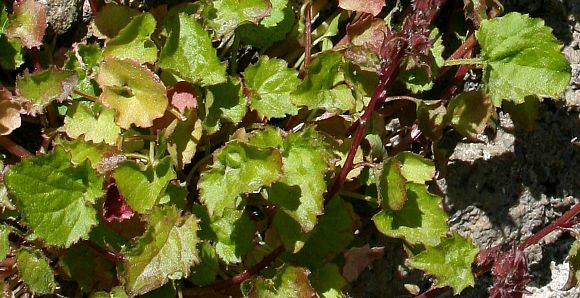 The leaves are cardioid (heart-shaped) and with or without somewhat irregular triangular teeth. The stems are said to be grey-hairy, but most of these specimens are neither, being reddish and only slightly hairy. Some of the flowers on these specimens have bright-red oval things on the petals, on the rock, but mainly on the intact stigmas. Perhaps they are insects? On the image above this one too. 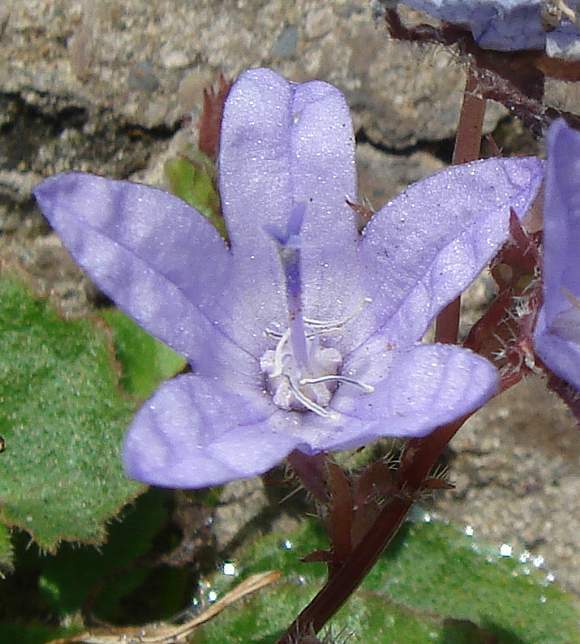 The calyx lobes [2 can be espied peeking out from under the topmost flower] are lanceolate to narrowly ovate (just lanceolate on the similar Adria Bellflower). The style on this specimen is split into 3 deeper-blue stigmas. 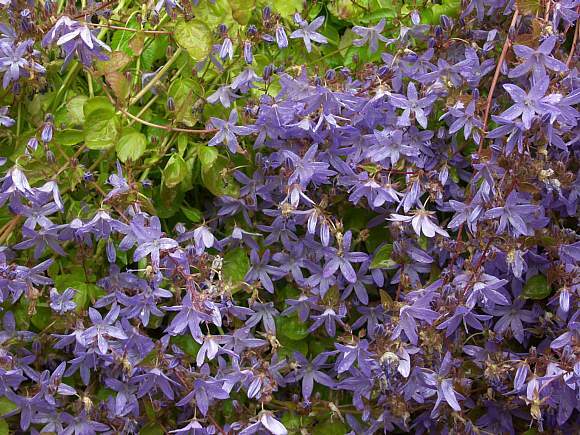 The upper flower has a style which splits into 4 stigma at the top. 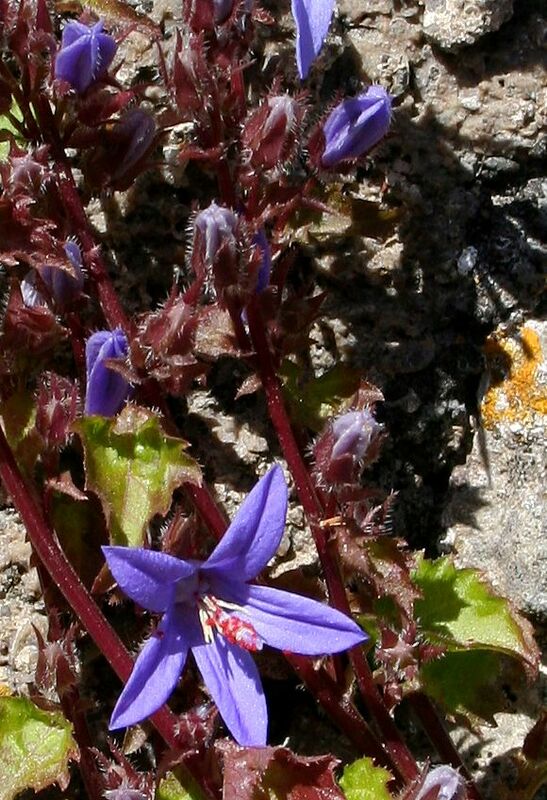 The lower flower has a club-shaped stigma, presumably it is this shape before it splits into 3 or 4). 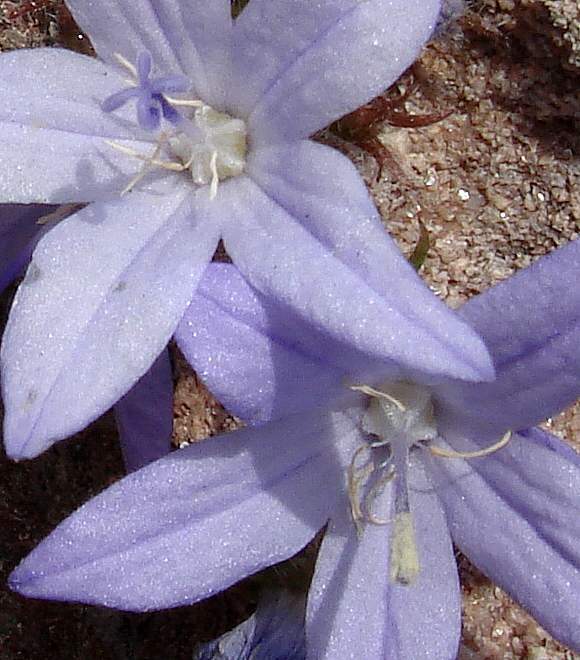 The stamens are white and wiry thin. The ovary in the centre is white with 5 radiating rubs. 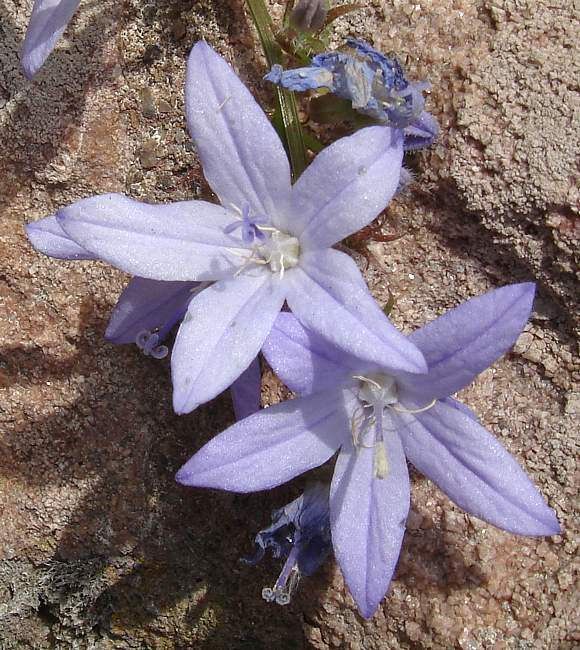 Easily mis-identified as : Adria Bellflower (Campanula portenschlagiana), in fact many people do according to Prof. Clive Stace (and he's not wrong)... 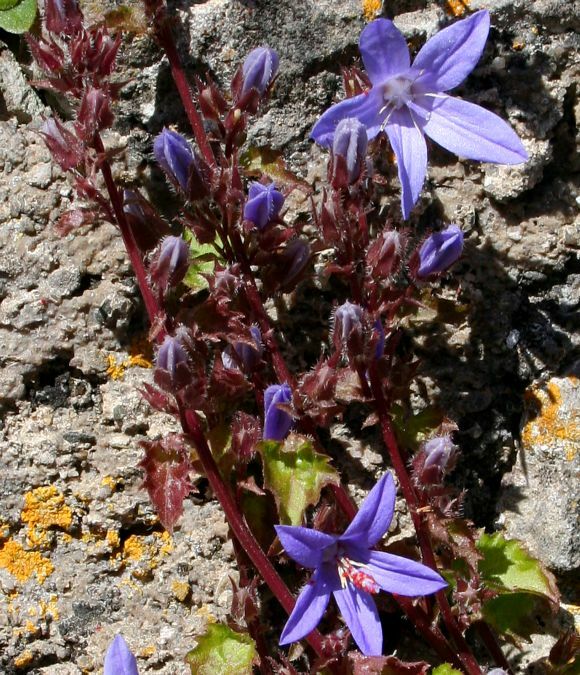 But sometimes, it might just be that botanists get the two specific epithets mixed up, for they are very similar, wouldn't the reader agree: (C. portenschlagiana for Adria Bellflower, C. poscharskyana for Trailing Bellflower). For the botanical differences between the two see the captions beneath the photos. 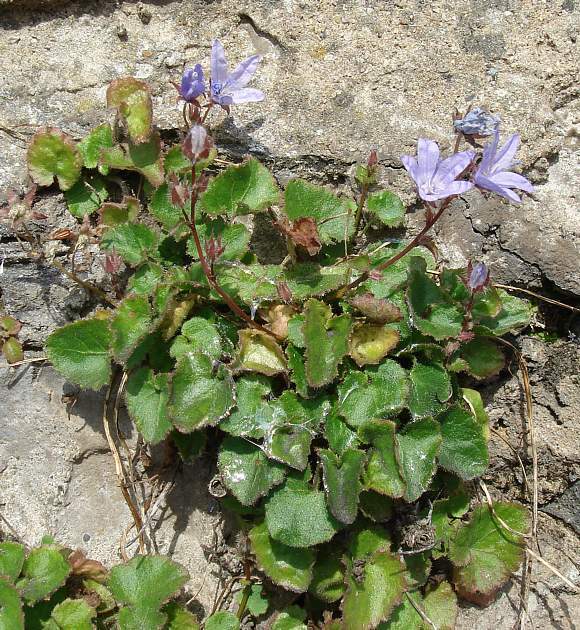 Some perceived similarities to : Spreading Bellflower (Campanula patula) but that does not spread along the ground as the name might imply (like the other two which spread along walls) but is instead bolt upright. Nor does it 'spread' by underground rhizomes. 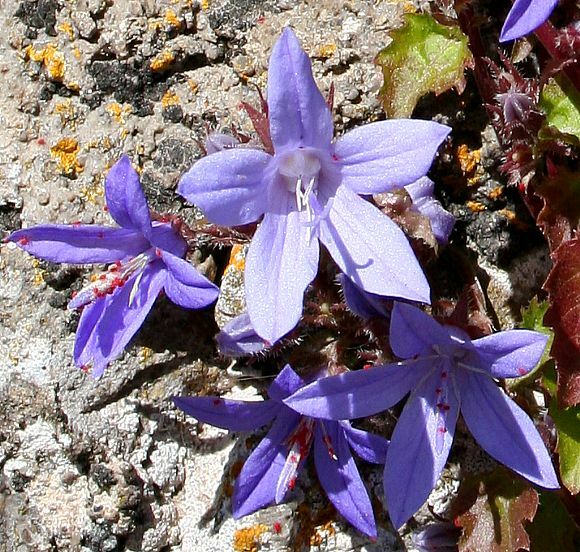 (The 'spreading' bit of the common name refers instead to the petals which spread out - er-um, just like those of Adria Bellflower). Spreading Bellflower is a rare [RR] whereas the other two are ubiquitous. Like many Bellflowers it is said to ooze a sticky white liquid from broken stems, but it is not toxic, and may even be edible. One source says this milky sap contains the diabetic 'sugar' Inulin which certainly is edible. 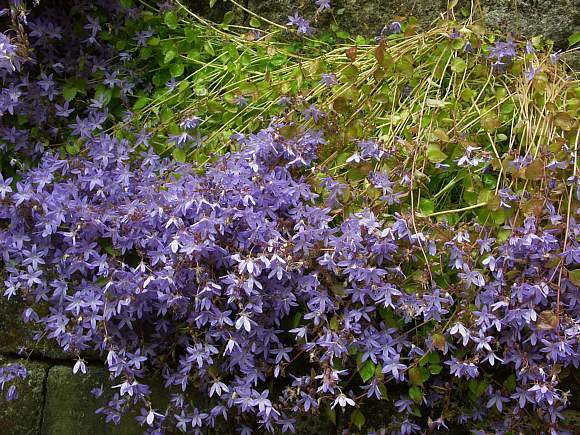 Many other sources claim that most bellflowers have a sticky milky sap, but none say which Bellflowers do not!